With 25 percent of its African-American residents jobless, Chicago has the highest black unemployment rate among the nation’s five most populous cities. Chicago’s rate is higher than Philadelphia’s 19 percent, Los Angeles’ 18 percent, Houston’s 15 percent and New York City’s 14 percent, based on 2013 U.S. Census figures. Experts point to Chicago’s unique brand of residential segregation, among other factors. Almost 75 percent of black Chicagoans live in a community that’s at least 90 percent black, according to Census data. Blacks are about one-third of Chicago’s population. 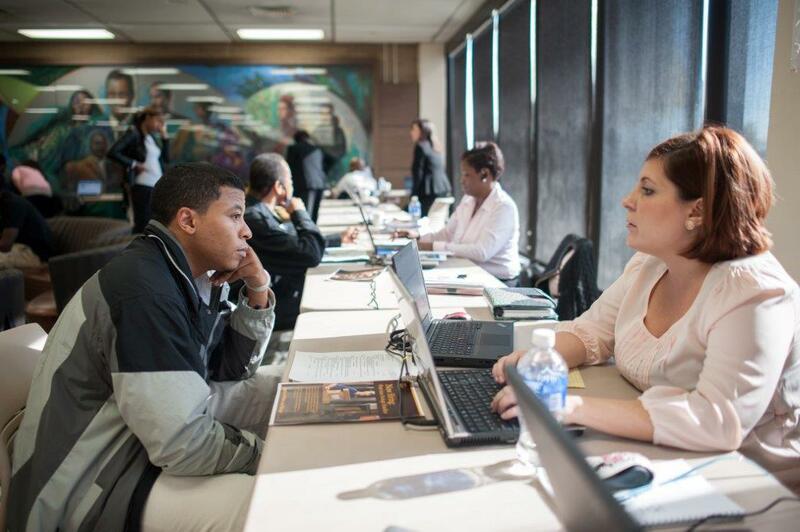 The unemployment rate for white Chicagoans is 7 percent; for Latinos, it’s 12 percent. Michael Dawson, a leading scholar on politics and race, said Chicago’s “extreme segregation” deprives many residents of the predominantly black South and West Sides of adequate public transit and job networks. “The way people get hired is through networks,” and most people’s social networks are predominately within their own race, he said. For decades, the city’s economically marginalized black communities have been saddled with failing, underfunded public schools, high youth unemployment and low college graduation rates. “You get neighborhoods where not only do you not have a job, you don’t know many other people who have one and can help you get one,” said Valerie Wilson, an economist who heads the Program on Race, Ethnicity and the Economy at the Economic Policy Institute, a Washington, D.C., think tank. But segregation alone doesn’t explain the situation. In a ranking of black-white segregation among the 50 metro areas with the largest black populations, Chicago was fifth on the list. Detroit, Milwaukee, New York and Newark metro areas were most segregated, in that order. Wilson emphasized that employment gaps and wage disparities in Midwestern cities have been exacerbated by hundreds of thousands of lost manufacturing jobs that went overseas or elsewhere. Residential segregation and the hemorrhaging of industrial jobs preceded Mayor Rahm Emanuel’s administration, and other big cities have been similarly afflicted. However, Dawson said some factors contributing to black unemployment have occurred on Emanuel’s watch. The black middle class relies heavily on employment with the city and the school district and has suffered disproportionately amid massive layoffs, said Dawson, a University of Chicago political science professor and founding director of the university’s Center for the Study of Race, Politics and Culture. Workers from predominantly black ZIP codes account for about 40 percent of the 5,000 city jobs cut since 2009, including more than 600 layoffs Emanuel implemented his first year as mayor. Those figures from the city don’t include the 1,691 public school employees from black ZIP codes laid off by the school district during that time. Dawson also said Emanuel’s administration has continued a pattern of investing in downtown and well-to-do areas while poor, minority communities are neglected. The mayor rode into office in 2011 atop a wave of strong support from black Chicagoans, with 59 percent voting for Emanuel, who benefitted from his ties as former chief of staff to the nation’s first black president. The issue of unemployment, along with Emanuel’s school policies, could complicate his February re-election bid. The Grassroots Collaborative, a community organizing group, said in a 2013 report that only 27 percent of more than 50,000 downtown jobs created between 2002 and 2011 went to Chicago residents. Dawson called for a concerted effort by local and national officials, as well as the private sector, to rebuild and expand infrastructure in black neighborhoods through projects that employ community residents, including investing in “green” jobs for the chronically unemployed. Wilson believes high black unemployment can be turned around with better schools, job-training programs, policies that create more diverse neighborhoods and enforcement of anti-discrimination hiring practice laws. She stressed the importance of programs and policies geared toward re-integrating people who have been incarcerated. Their criminal records make it difficult to find jobs in communities that have few opportunities for employment. When gallons of oil spilled into the Gulf of Mexico, it was considered a national disaster. It joined the ranks of other catastrophes like the earthquake in Haiti and the flooding of New Orleans.